Description: This 80-acre parcel can be acquired for just $19,500 ($244/acre) with only $500 down and the balance of $19,000 payable at the rate of $190 per month (amortized over 186 months including 9% with no prepayment penalty). This parcel is currently not suitable for residential purposes (no utilities, power, water, maintained road) but ideal for hunting, camping, summer use, and as a long term asset for inflation protection. Price: $19,500 ($244/ac) with monthly payments of $190 (no credit checks and no prepayment penalties). 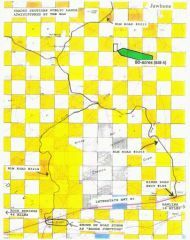 Access/Roads: This property is located in the checkerboard area (resembling a checkerboard with ownership alternating between private and federal) and access is per long standing BLM (Bureau of Land Management) policies. Private owners can cross BLM land to get to private property but the public can’t cross private lands to get to BLM property. An actual road, however, may or may not exist at this time. Surveys: All sections were surveyed by the federal government at some time in the past but private surveys into smaller tracts have not been completed. 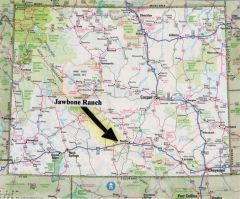 Directions: From Rawlins, Wyoming drive west on I-80 approximately 16 miles to Riner Rd. 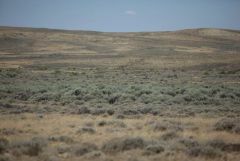 (Exit 196) or approximately 22 miles to Baggs Junction (BLM Rd 3218). Refer to the parcel map where the arrow points to the parcel for sale.